Formed from 10th (East Riding Yeomanry) Battalion The Green Howards. Very little information is available regarding the 12th (Yorkshire) Parachute Battalion and in 7 years, we have only spoken to 3 surviving veterans of 'A' Company. All of which shared the same experiences and corroborated each others information. Our deepest gratitude goes to them for their kind assistance in providing us with the some of the following information. A special thank you must go to Sjt. 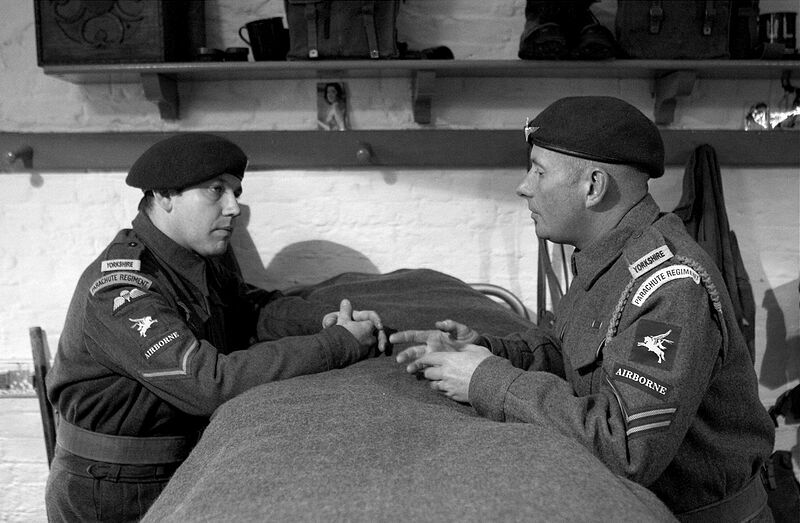 Tailor who served with 1 Platoon, 'A' Company and who's remarkable information has enabled us to piece together some of the missing links in the Battalion's history. What follows, incorporates some of their story and is dedicated to them.
" as you went down the hole. It was not un-common for you to catch your nose on the edge and if any part of your kit got snagged; you usually ended up with the next lads boots on your head ". Having completed their training. The Battalion was sent to Bulford Camp for enhanced infantry training. The first fully operational tour was D-Day. At 5am on 6th June 1944 'A' Company and the battalion were parachuted into Normandy. The 12th (Yorkshire) Battalion, as part of the 5th Parachute Brigade, was tasked with taking and holding Le Bas de Ranville. The 12th, along with the 13th battalion, defended the South East of Ranville and bore the brunt of the German counter attacks. On the 7th June; one of these counter attacks involved seven tanks and supporting infantry of company strength. the attack fell on 'A' Company's position. This force knocked out the crew of the sole 6-pounder anti-tank gun supporting the Battalion but was checked when one man (Pte. Hall) ran across to it and succeeded in destroying three panzers in quick succession. Following Ranville. 'Windy' Gale ordered the 12th Battalion, already under strength and as Divisional Reserve, to take Breville. The scene of vicious fighting for the 13th Parachute Battalion, who killed 200 and took 150 German's as Prisoners of War, the 153rd Infantry Division and the 9th Parachute Battalion. The 9th battalion was reduced in number, following an attack on the 12th June, to just 200 men. The attack was mounted from the eastern outskirts of Amfreville, with support from 'D' Company 12th battalion The Devonshire's, 22nd Independent Parachute Company and a Squadron of the 13th/18th Hussars. At Breville. The 12th (Yorkshire) battalion lost all of it's Officers and Warrant Officers, either killed or wounded, including the Commanding Officer - Lt. Col A.P. 'Johnny' Johnson; who was killed by artillery fire. possibly from a salvo fired by the 51st Highland Division that fell short. Of the 550 men of the 12th (Yorkshire) Parachute Battalion who dropped into Normandy and the 300 who began the attack on Breville; only HQ Company and 55 men from the rifle companies remained.... but Breville was in Allied hands! Following rotation to the rear for rest and re-equipping. The Battalion took the village of Putot-en-Auge and saw action at St. Julien, under Lt. Col N. Stockwell, before being sent to the Ardennes where the 12th Battalion was tasked with breaking the German perimeter at Bastogne enabling the encircled Americans to break out. Again; the battalion succeeded in it's objective and the strangle hold was broken. 'A' Company, 12th Battalion then embarked on the SS Chitle and headed for Bombay and Calian where they undertook jungle fighting. From here they again embarked on the SS Chitle for Malaya and fought through to Singapore, Changhi jail and Java. Following operations in Java; they once more embarked on the SS Chitle returning them to Malaya. It was on this journey that the 13th Battalion undertook to mutiny. They were dis-armed and placed under guard by the Middlesex Regiment and upon dis-emarking were immediately disbanded. No charges were ever brought against anyone in the 13th Battalion but the incident was 'swept under the carpet'. Because of this unfortunate matter; the 5th Brigade was also disbanded with troops being sent to different places. 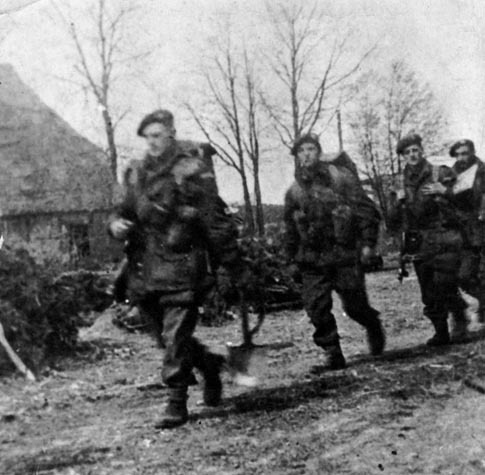 During the Rhine Crossing (Operation Varsity), the 12th (Yorkshire) Parachute Battalion landed on DZ 'B' north west of the town of Hamminkeln. the Battalion, under Lt. Col K. Darling, was tasked with securing the ground between the DZ and Hamminkeln. This included taking out a troop of 88mm guns and linking up with the 3rd Parachute brigade. The 12th Battalion saw action at Lengerich, Hasbergen, Wunstorf, Altenhagen and Berdenau. Over 7 days; the 6th Airborne Division advanced, on foot, and fought their way to the Baltic port of Wismar where they linked up with Russian troops. 4 Para absorbed 15 Para (SV) in 1993 and 10 Para (V) in 1999 to become the Parachute Regiment's only reserve Battalion. It should be noted that neither the 7th or 12th Battalions participated in the mutiny on board the SS Chitle. There is some speculation amongst the surviving veterans that the reason behind the limited available information on the 12th Battalion may be due to the Chitle incident. Alas it may be that we may never know the true reason behind such limited media; but one thing is a certainty. The 12th (Yorkshire) Parachute Battalion served with distinction and honour and maybe one day; the full story of this fine Battalion may be fully uncovered. 'A' Company - Germany, 1945. Mr. Campbell Gray is 2nd from right. Written by Mr. Campbell Gray, 'A' Company, 12th (Yorkshire) Parachute Battalion. At last we got the order to "Hook-up" and "Stand To". I was No 2 to go. you had to rely on the guy behind you handing you the end of your static line, making sure it was free of entanglement prior to hook-up. all eyes were then glued to the lights above the aperture. There was some light anti-aircraft fire as we crossed the French coast. Then "Red On" bawled the dispatcher (RAF) followed by "Green On" " GO GO GO" and through the aperture we went as fast as possible. We were going in about 500ft and it was essential to have a fast despatch to ensure that we would be closer together on the ground. It was a moonlit night with some light cloud. I had quite a good descent, landing a bit heavily but safely in a corn field with stalks up to my waist. The danger at this point was probably being shot by one of your mates so a simple code system had been devised, the first day being "Ham" to be answered by "Egg" - the next day "Bread" and "Butter". I gathered myself together after releasing my harness and dumping the jump jacket. The jump jacket was put on over your outer equipment so that your lines on despatch couldn't snag on anything. I then had to get to the Rendezvous Point which was a quarry just on the approaches to Ranville. As I proceeded I heard movement just ahead of me and I went to ground and gave the code sign "Ham" and got the "Egg". It happened to be a signaller of my own platoon and he had injured his back in the drop. We got to a hedgerow at the side of the field and he couldn't go any further so I had to leave him there and carry on. We had been told at the briefing not to stop to help wounded or injured men under any circumstances - the objective was top priority and would require the maximum number of men to achieve this. I eventually reached the quarry being guided by a flashing red-light for my battalion, the others being a hunting horn and a whistle, they having different rendezvous points. The Drop Zone was coming under fire by this time but most of us were clear of it by that time. I was C.O. 's signaller and reported to him on arrival. By around 3a.m. and only about half-strength the C.O. decided to move on to secure Le bas De Ranville and resistance was fairly light, the Germans having withdrawn to a wood to the South and by 4a.m. we were well dug in. Many of my battalion were dropped in the wrong area and in some cases it was a few days before they got to us. Things were remarkably quiet for a short time and then around 4a.m. we heard the naval barrage starting and knew that the seaborne landings were about to take place. The attack would be preceded by a barrage around 9.45 and the attack to be launched around 10p.m. supported by a few tanks. Unfortunately the first salvo fell short and landed on the road we were in and our C.O. and several of H.Q. personnel were killed and others wounded. The Germans then laid down a counter barrage just as the attack company moved off and they were cut to pieces in the open ground approaching Breville. I went in with the second company and had to pass through the dead end wounded of the attack company . The Company Commander, although lying wounded, waved us on to keep going. I reached the edge of the village with a number of others and got pinned down in a ditch. After taking our bearings we moved out to reach the Breville crossroads exchanging fire as we went. I still had the wireless set on my back but had lost the aerial and things were a bit uncertain to say least, the village was virtually on fire from end to end. At the crossroads we came under a very heavy bombardment and again had to shelter in a ditch for what seemed like hours till eventually except for some spasmodic small arms fire, we had secured our positions. We lay all night expecting the usual counter-attack but at dawn patrols sent out reported that no enemy was contacted, Breville had been taken at last and our bridgehead was complete.